Many personalities deserve the title for Kenya’s person of the year 2012. Many have contributed to this country a great deal in the past year. Notable Kenyans have shaped 2012’s political, entertainment and sports sectors in a big way. David Rudisha continued his track successes when he broke the 800m Olympics record in London. This landed him an invite from Arsenal football club, to watch a game at the Emirates. He was then in contention for the IAAF world athlete of the year, where he lost narrowly. All in all, 2012 was another great year for Rudisha. Prezzo did the country proud in South Africa during the Big Brother Stargame when he survived till the last day. He became Kenya’s best performing housemate by emerging number 2. During his stay in the house, he was able to rally Kenyans behind him, including during when he was on the eviction table together with a fellow Kenyan. He received endorsement from many quarters including from politicians of all all sides. 2012 was definitely a great year for Jackson Makini. President Kibaki is another strong ‘Person of The Year’ contender. 2012 was his last full year as president, and if it were not for a court ruling, it would have been his last. 10 years into his presidency, Kibaki has led Kenya to economic heights never seen before. His biggest win was infrastructure, and as fate would have it, he just recently officially opened his biggest road project, Thika Road. He also has opened Syokimau Railway Station, the first to be built by Kenya’s (black) government. Kibaki had previously launched the Sh 2 trillion Lamu Port and Lamu Southern Sudan-Ethiopia Transport Corridor (LAPSSET), alongside several East African presidents. This are however just a few of the things Kibaki had done as president. During his 10 year tenure, the country has had free primary education, improved electricity generation, increased tourism figures, etc, alongside many cons, among them, the bloodiest post election violence, increased corruption and rising insecurity. Kibaki’s gamble on Somalia paid off in 2012, when the Kenya Defense Forces defeated Al Shabaab. 2012, was probably the best year for Kibaki’s legacy and he would make a good ‘Person of The Year’. However, we have someone else in mind. 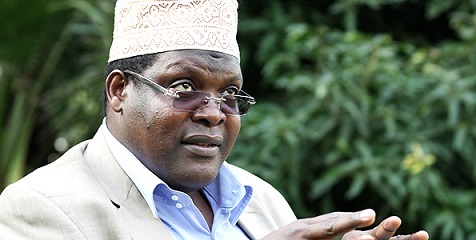 Miguna Miguna. The man with the same name twice, was the most mentioned person in Kenya and Google confirmed this in their annual trends list. He may not have been the most liked man in 2012 but everyone could not resist talking about him. It started when he was suspended from his job as an adviser to Raila Odinga. He pledged to release a ‘tell-it-all’ book detailing the evils in the Office of Prime Minister, by the Prime Minister himself and by persons close to him. The build up to Peeling Back The Mask’s release was splendid, and by the time Miguna was releasing it to the public, there was a lot of anticipation. During the launch of the book, Miguna used words that quickly became a national motto, Come Baby Come. This he used to tell anyone considering legal action. Soon, everyone wanted to be associated with the three words and blogs like this one were having a field day with easy traffic directed at related articles. Immediately after launching his book, Miguna allegedly ‘fled’ to Canada only to return a few weeks later to continue with his book promotion. He made trips to Mombasa, Nyeri, Kisumu, Murang’a among other places. While in Mombasa, Miguna received a hostile reception with a man by the name ‘Destroyer’, giving him the ‘baddest’ of times. He lost his trademark cap and a shoe. Pictures of a bald Miguna were splashed on newspapers across the country, mostly because this was the first time Kenyans were seeing him without his most important attire. Point is, Miguna was news. For breakfast, lunch and supper, Kenyans were given a lot of Miguna. ‘Peeling Back The Mask’ revealed some information that would have forever remained in the dark; for example, who would have thought that James Orengo wears Ksh 500,000 suits? Or that Kibaki once held consultations with Raila behind curtains? Who would? Miguna then announced that he would be contesting for the Nairobi County Governor seat, on an independent ticket. He has officially entered politics. 2013 will for sure be another big year for Miguna, with the release of a new book, and the elections of course.. But as we look back to 2012, Miguna Miguna deserves the title of Person of The Year.